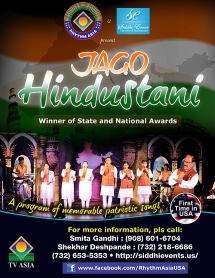 Cartersville Ram Mandir: "Jago Hindustani"
A unique program of entertainment and enlightenment called – “Jago Hindustani” with advanced sound, light effects and elaborate costumes is a one-of-a kind program with a theme that revolves around Indian culture and freedom movement depicting the present social conditions. It has professionally trained Radio and TV vocal artists. The group has won two national awards and two state level awards and has presented over 2000 programs throughout India in the last 19 years. The entire theme of the show amalgamates memorable patriotic songs like Mera Rang De Basanti Chola, Suno Gaur Se Duniya Walo, Maa Tuhje Salaam, Sandeshe Aate Hai, Kandho Se Milte hai Kandhe, Phir Bhi Dil hai Hindustani,Yeh Jo Desh Hai Mera, Chak De India, from old and new Hindi films which will have the audience singing along. Time: 6 pm dinner, program 7:30 pm. Cost: $15 per person, includes dinner served from 6:00 to 7:30 PM. Venue: Cartersville Ram Mandir, 41 Smiley Ingram Rd SE, Cartersville, Georgia 30121. Contact: cartersvillerammandir.org, 770-386-9274.